It’s been quite a while since I’ve written a story about an NBC News:VIPs survey. I had thought that maybe the plug had been pulled because it had been so long. Recently, however, I heard that the surveys had started up again. Not all of them are relevant for the purposes of this blog. But when they are relevant they can be very illuminating. It was an NBC News:VIPs survey that foreshadowed the debut of Wake Up with Al (Roker) on The Weather Channel. Another forshadowed MSNBC’s turn back to POV analysis programming which began in earnest in 2011. Three screen grabs from this survey were forwarded to ICN and all of them tell a tale, though what exactly the tale entails is open to interpretation. So let’s get on with the interpreting! The first slide alone tells us that WSJR with Maria Bartiromo is being evaluated by the NBC brass. I don’t think I’ve ever seen a ratings report on the show, either for syndication or for its CNBC airings, so I have no idea if ratings are or are not a factor here. 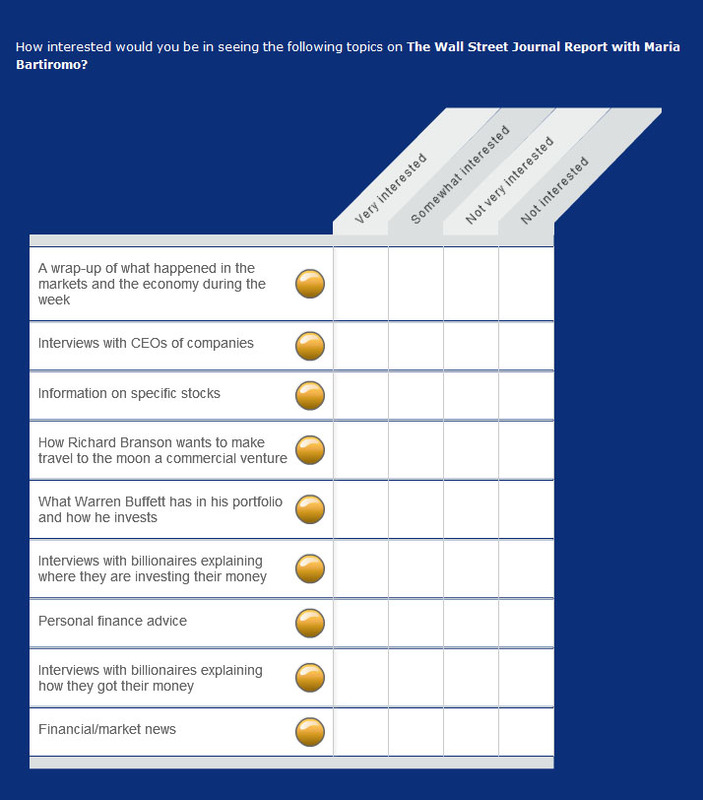 Some of the questions stand out more than others…especially the first one. 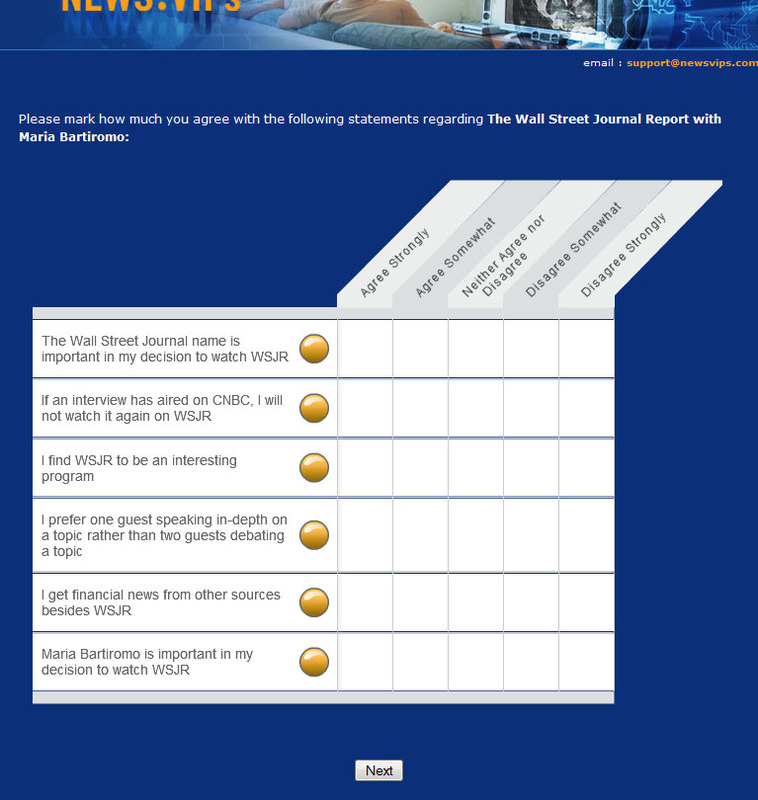 1) The Wall Street Journal Name is important in my decision to watch WSJR – It’s 2012…the year that the Wall Street Journal/CNBC deal is supposed to expire. Conventional wisdom has been that the WSJ’s owner News Corp. is going to put the WSJ brand and its staff on FBN. I hadn’t considered the possibility that this likely WSJ scrubbing by CNBC would extend to syndication but this question surely must be gauging viewer opinion on what would/might happen if CNBC is forced to drop the WSJ name from this show. There is a similar question at the bottom regarding Maria Bartiromo but I would be very surprised if she either got yanked from the program or took herself off. The whole point of the show is basically to be a vehicle for Bartiromo. If she got taken off what’s the point of the show? So I don’t read much at all into the inclusion of this question. The rest of the questions are about show format. I am unfamiliar with the format of this show so I don’t know if these questions refer to scenarios that already exist or scenarios that are being contemplated. This is very interesting. 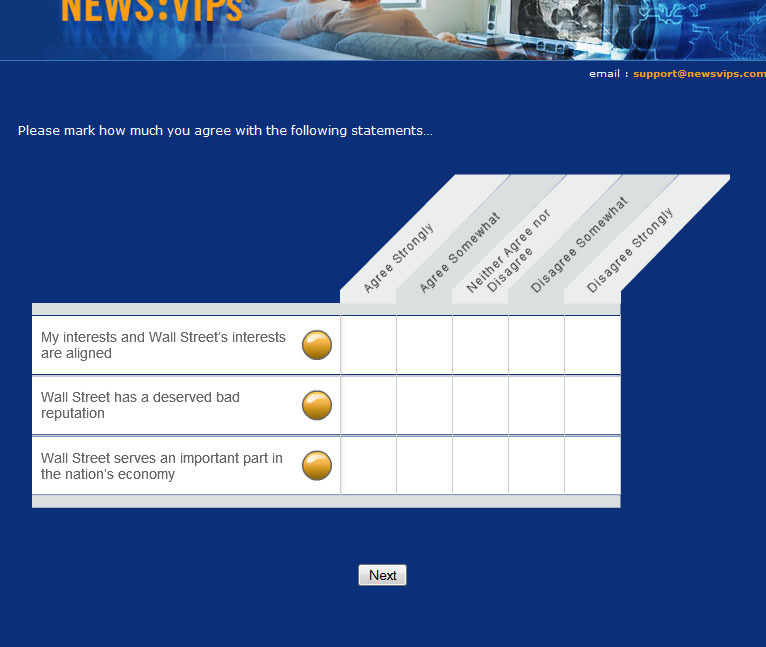 The survey is trying to figure out what the viewers think of Wall Street as a concept. How this folds back into the show is anyone’s guess. If the survey comes back decidedly negative regarding Wall Street will the show start channeling Dylan Ratigan on MSNBC? Unknown. These question are all about format. Everything seems to be on the table. How these questions are answered may well impact how the show is produced in the future. This entry was posted on May 17, 2012 at 8:50 pm and is filed under CNBC. You can follow any responses to this entry through the RSS 2.0 feed. You can leave a response, or trackback from your own site. I’ve seen the show a few times in the past and the format, as far as I can remember, is centered around Bartiromo interviewing a corporate CEO or some head regulator. The guests are usually high profile, in the business world, and the questioning is usually pretty sympathetic; which is why the guests come on the some, I assume. There may be other parts to the program but I can’t remember them. I don’t think the WSJ plays a big role other than the occasional WSJ reporter being questioned on a story. I’m not a big fan of Bartiromo so I found the show not much to my liking. If they got a better host (one that wasn’t so fawning) then I might watch more but then the big time guests wouldn’t be so eager to appear on the show. I like the Chris Matthews Show better than Hardball (better format and CM is more restrained) but I can never find it on the schedule and so only see it when I happen upon it accidentally. I’d love to see it move to MSNBC weekends. fritz3, I vaguely remember WSJ report with Bartiromo but if it is anything like her CNBC persona, I am sure the interviews are powder puff. Of course, that seems to be how many of the sycophants on CNBC act – nauseatingly nice to any dumb schmuck with money. There is a reason she is the queen bee of all the sycophants. I DVR the Chris Matthews Show and you are right, it is pretty good (mostly because Chris is subdued). Since the show is a short recap of the week’s political news, Chris hardly has any time to get on a political rant. The panel has some of the best journalists from a variety of sources so I like hearing their thoughts on the news. In my area, The Chris Matthews Show airs on Saturday morning, 5:00am central time on my local NBC station. It precedes the local weekend news.